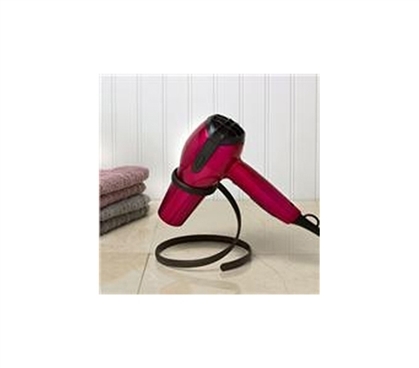 Stores your hair dryer at your fingertips so you'll never lost it! No cabinet space? No problem! Dorm Co. Tip: If you have a place for it, you can't lose it! Hair dryers are often big, bulky, and never fit where you want them to. Thankfully, the College Hair Dryer Holder gives you a place to store this college essential when you're not using it, and keep it upright when you are. Gone are the days when your hair dryer falls off the bed or the counter, and say goodbye to losing it under all of those sweaters you've been meaning to hang up! With a singular place to put your hair dryer, you will find that your dorm organization is much improved - at least for the time being! With a sturdy steel construction, the College Hair Dryer Holder is one college accessory that won't fold under pressure and can be used year in and year out. While it's never easy to decide which college supplies are essential, the College Hair Dryer Holder in Bronze is a versatile dorm room space saver, allowing you to store your dryer and organize the things you use most.